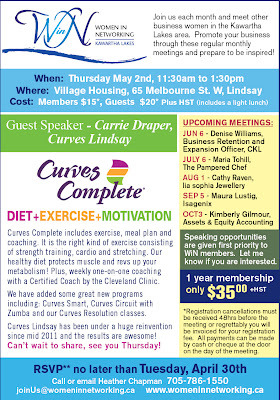 Next Thursday is our next WiN meeting and what a great way to kick-off spring by hearing from Carrie Draper of Curves Lindsay. She will be talking about the Curves Complete program for a "healthier" you!. Full details attached. Please let me know asap if you are planning to attend. I look forward to seeing all of you next week!